Front row internet workshop participants David Shija and Celina Matuja from Radio TV Tumaini enjoying the morning session on blogs and citizen journalism. 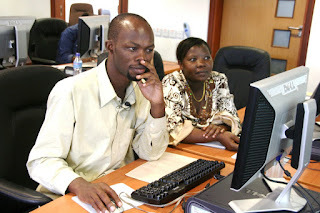 Basil Msongo, Habari Leo, with others attracted to his computer. From left, Regina Mwalekwa from Radio One, and Joyce Njarabi, Radio Uhuru. On the right Jiang Alipo, Daily News. Here’s Zuena Msuya, news reporter from Tanzania Broadcasting Corporation (TBC), concentrating on how to post new images to her blog. All workshop photos by Maggid Mjengwa. For the last feedback postings on “what we are taking home”, please visit the workshop participants’ latest entries. Here’s Bilham Kimati of Nipashe, here’s Peter Edson of Mwananchi and here’s Joyce Njarabi, Radio Uhuru. For Kiswahili readers, soma zaidi katika blogu ya Zuena Msuya, TBC, or Basil Msongo, Habari Leo. They have posted many pictures from class too. Links to all blogs on the right. On my own behalf, I just want to say many thanks to all participants for being such a wonderful, active, so motivated and debating group. I hope you will be making much use of your new skills when you get back to your media houses and also do your best to share any of your new know-how with your colleagues at the offices. All the best. The participants are now eagerly posting pictures to their blogs, both photos taken in class and any others picked from the web. You will also find postings on yesterday’s (and in many cases this morning’s) assignment. The participants were this time given a little more complex search exercises, six different topics to choose from, and a short posting was supposed to be produced based on the facts found via the internet. Bilham Kimati, Nipashe newspaper, is writing an almost militant commentary about the international boycott campaign against products of the Nestlé company. It has to do with mothers being tricked to quit breastfeeding too early because of aggressive marketing policies of the companies trading the so called baby milk substitutes. Jiang Alipo, again, has produced a good and balanced story on the mysterious collapse of the World Trade Center Building 7, the third tower in New York to come down on 9/11, even though it was not hit by any plane and it was situated more than a hundred metres away from the two Twin Towers, WTC-1 and WTC-2. Other good postings were done on the Egyptian football player Mohamed Aboutrika, widely expected to be awarded next week as the African footballer of the year. See the story by Phillip Bugobora, Radio Passion FM, with good links to original sources and also a picture of goal-scorer Aboutrika taking off his national team’s jersey at an African Nations Cup match to reveal a T-shirt below with the text: “Sympathize with Gaza.” You can also go to Basil Msongo’s, Noor Shija’s and Keregero Keregero’s postings on the subject. Many others chose to write about the childhood years of Barack Obama, with photos posted too, but unfortunately these stories were mostly copied directly from the Wikipedia. Workshop participants busy by their computers this morning. In the front, Mkombe Zanda, editor at Radio Times, and Jiang Alipo, reporter from Daily News. Thanks to Maggid for the picture. More images in his blog. Today we have had the whole morning a guest lecturer in class, as Maggid Mjengwa has been showing to us his blog and telling how he operates it, updating pictures and comments usually several times a day. Maggid is a long-time friend of mine from Iringa, journalist, columnist of Raia Mwema, and nowadays also heading the Tanzania programme of the Swedish NGO, Forum Syd. His blog has become in recent times one of the most famous and most visited blogs in Tanzania, giving a sympathetic picture of the lives Tanzanians are living in both the rural areas and in the cities – and also abroad. Sometimes you can find pictures of concert posters of Tanzanian bands touring Scandinavian countries, but usually you’ll see photos of people and peculiar events wherever Maggid moves, telling a story often more worth than thousand words. Lately, there’s appeared in Tanzania several other very good blogs, each of them focusing on one particular topic. For the situation of albinos in Tanzania, go to see the blog of local independent online journalist Richard Mbuthia, with latest news concerning the killings of albino people for witchcraft purposes and politicians rambling about the disaster. Another interesting site is the fashion blog by Shamim Mwasha, journalist of the youth-oriented entertainment site Darhotwire. These days she has posted pictures of Valentine’s Day gifts and a wide collection of ladies shoes. Very recommendable is also the Mama na Mwana blog by young mother of little baby boy, with happy photos of babies and comments about baby care. My last favourite is however Tuntufye Abel’s blog on football coaching, with comments and advice. Some of his postings will help us become more enlightened followers of the most popular and lovable of all sports. Here’s a list of some local and international websites we went through yesterday, useful not only for journalists but for anyone with the desire to find information. And for Tanzanian online media, I’ve added links separately to the column on the right side of the page. But here are the other links. Tanzania government Here you will find all statistical data of the country, national budget and so on. For reaching the different ministries, better to go directly to the section National information by topics with the giraffe image surrounded by links. Bunge, meaning the parliament, has a good site with CV’s of all MP’s and other info, but it’s just a bit too slow to open. Tanzania Online The only functioning Tanzanian web portal, has many links that you might also easily find by googling. Jamii Forums This is the Tanzanian discussion site, with the slogan: “Where we dare to talk openly.” Here people use to leak out scandalous documents of corruption etc. that wouldn’t be published in the mainstream media. Reuters Africa Latest news country by country updated constantly if news happen. If things at home are relatively cool, meaning no huge floods or wars or rigged elections, the site might include only week-old business news. IPS News “Tells the story underneath!” Well written news features from the South produced by journalists from the South. allAfrica.com Content from more that 125 African news organizations. Read papers from Cameroon to Kenya. Of the Tanzanian media houses, only Arusha Times has joined this news portal so far. Awdal News Curiosity from Somaliland. Online journalism can be a great media in a country with long distances and lack of paper, as long as wireless connections are there. Links to other Somalian sites at the bottom. Pambazuka News Pan-African forum for social justice. Old wise guys writing clever stories with the background idea that Africa shall unite. African Elections Database Compiled by a chap somewhere out of Africa with numbers of votes, percentages and all other details from every election since colonial times. African Literature and Writers on the Internet A web portal hosted by Stanford University in California with hundreds of links to websites on African literature, from sites on Chinua Achebe to Zimbabwe Book Fair. African Studies Internet Resources Web portal by Columbia University, New York. So many links that you can choose by region, country or topic. Kenyan blogs Read postings from Kenyan Pundit and hundreds of other active bloggers from Kenya. The latest Kenyan blog posting will appear on top. Some Tanzanian blogs you can find here. Hello in many languages. This is one of my personal favourites. If you can greet in Nyakyusa language and also say “thank you”, you might reach far. Here you can also learn to say “hallo” in about 20 different German dialects. See new postings on what we’ve been doing. Links to the blogs of everyone in class are now found on the right side of the page. Noor Shija, foreign desk editor of the Uhuru newspaper, lists a good number of sites he says he will visit regularly in the future, from the Inter Press Service news agency to Pambazuka News which provides sophisticated feature stories by African intellectuals about broader issues going on in the continent. 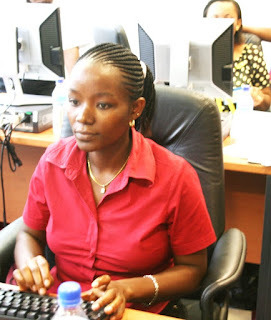 Jiang Alipo compares Tanzanian media websites and picks up her favourites, Tanzania Daima among them. Also Gladness Munuo says she will go on reading Tanzania Daima online, not only because she enjoys the stories but also because the website is structured in a very simple and reader-friendly way. Another topic today was to provide links from the postings to the original sources or websites mentioned. Generally, that was not a success. Maybe we will have to repeat a bit tomorrow. But for viewing pictures, I recommend the blog of David Shija, TV producer at Radio TV Tumaini. The last posting includes photos from the nasty loss of Liverpool against Everton in the English FA Cup yesterday night. David’s links are also functioning well and he’s added the links to all participants’ blogs. Well done! The workshop participants are tapping their keyboards like early morning birds, writing their next postings about ideas that came up during yesterday’s sessions. In the morning we visited practically all Tanzanian media house websites, made comparisons and discussed how the journalists in the class are taking part in the process of the updating of their companies’ sites. The developments in this area are fast in Tanzania. Three years ago, there were only three media companies that had a website for publishing news content: IPP Media, which launched their website already in 1995, and two others, the weekly newspaper The Express and a regional paper, Arusha Times. But today most newspaper houses are also online, also some TV channels. Daily News has video content, Mwananchi publishes readers’ comments, many others have search possibilities, and some just seem to have developed a very convenient, functional and reader-friendly design. We also made some comparisons with Kenyan Daily Nation, Monitor from Uganda (with lots of advertisements! ), the South African Mail & Guardian, and visited some international news sites from BBC and Reuters to Al-Jazeera and IPS News. I also showed the news portal AllAfrica.com where you can read the latest stories from 125 African news sites. In the afternoon, we started doing some simple fact-finding searches, finding out names of capitals and presidents, and populations of other countries. The last topic was to tell about the background of the president of Bolivia. So, first you had to find out who is the current president of the country and then make a separate search with his name. So now we all know a bit about Evo Morales, the former trade union boss of coca farmers and the first Bolivian “Indian” to be elected as president. To get a good understanding on Tuesday’s session, I suggest visiting the participants’ blogs. Gladness Munuo writes with great enthusiasm about how it was to open her own blog. Bakari Mnkondo explains some of the central issues yesterday and refers to a speech by media tycoon Rupert Murdoch of News Corporation given to American newspaper editors. Phillip Bugobora from Radio Passion FM makes a compact news item of the whole day and quotes some of the most essential points of Mr Murdoch. Jiang Alipo elaborates more on what will happen to the traditional media, especially newspapers, as young people have made the internet their basic source of information – not only in America and Ulaya but also globally. Celina Matuja from Radio Tumaini gives good feedback on the whole course so far and explains how journalists can make use of the internet for producing better stories and programmes. She has also posted a picture to her blog!!! The participants have opened their blogs this morning and made their first postings. The topic was a free reflection on what we were doing yesterday and what expectations they have for the coming week. Here’s some links to the comments. Bilham Kimati from Nipashe newspaper gives a nice account of yesterday’s programme. Hyasinta Timothy of the business paper Majira provides a list of some of the many websites we visited during the day. Jiang Alipo of Daily News and Peter Edson from the newspapers Mwananchi and The Citizen explain how they wish they will use their new internet skills in their respective media houses in the future. Gladness Munuo, gender activist and freelance journalist, suggests that similar internet training workshops should be organized also for journalists in the countryside. Bakari Mnkondo, editor of Mzalendo newspaper, and Basil Msongo, reporter from Habari Leo, seem to be in the blogging business to stay. Bakari says that he will provide stories from the life of the people in the villages in the rural areas; Basil is introducing us to the first Tanzanian blog concentrating on stories about life experiences. The workshop was very lively today, with many good discussions and participants sharing experiences on how their media houses are coping with different issues connected to the training – for example at what time of the day their media houses update their online content, or do they do it even during the day etc. For today’s programme more in the participants’ blogs. I will provide links to all of them as soon as I can. This is my first posting from an internet workshop for Tanzanian editors and journalists which started here in Dar es Salaam today. So far, we have 18 journalists in class: eight from print newspapers, seven from radio and TV, one independent newspaper correspondent and also one student and two facilitators from MISA-Tanzania, the local chapter of the Media Institute of Southern Africa, one of the workshop organizers. Myself, I’m a journalist from Finland and trainer of the workshop. The training is organized by MISA Tanzania together with the VIKES Foundation of Finland, the international solidarity foundation of the Union of Journalists and other Finnish media organizations, with financial support from the Ministry for Foreign Affairs of Finland. This is already the third workshop of this kind since August last year. It is part of a training programme on internet for journalists planned to run for three years. For more on the previous workshops, you can visit the workshop blogs here and here with links to the blogs produced by the participants. Then some words of the day itself. We started a bit late, when most participants had arrived and the computer and internet facilities were running well enough. Many thanks to the IT support people here at Tanzania Global Development Learning Centre for fixing things up fast. After an introduction of participants and some tea with snacks, we did a few practical rehearsals: buying a train ticket in Finland via internet, finding a seat for a Tina Turner concert in Helsinki next April and making a booking for a Kenya Airways flight to Bujumbura. The purpose was to show how people in other countries are using the internet for getting some services, as the same developments are coming fast over here as well. I almost made a bet with Jiang Alipo from Daily News that within two years Tanzanian bus companies will also have developed online booking. Internet banking has been in Tanzania already for a while. 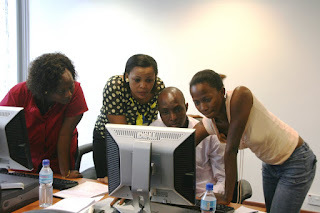 Then we spent some time editing the media section of the Wikipedia article about Tanzania, watched a funny football video at YouTube and visited the ICT site Slashdot.com where users are providing most of the contents. At the end of the day, I showed some statistics on internet use in different countries, and a tense debate arose about the credibility of the data. If we believe the website Internet World Stats, the share of the people using the internet in neighbouring Kenya is eight times bigger than in Tanzania. Now some argued that the figures for Tanzania cannot be true as today even in the distant Mtwara region doctors and many NGO’s are connected to the internet and you would find internet cafés even in small towns. 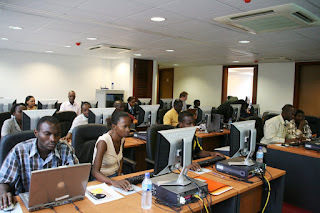 But others were more sceptical and said the figures were probably quite correct mentioning as a real-life example that here even some of the university graduates coming to media houses fresh from school seem to have almost no experiences of using a computer. At this time of the day, the air-conditioning went down for a while. As the temperature outside is just about 35 degrees, the atmosphere in class was truly a bit hot. Journalist from Finland working for YLE Radio 1 and also doing journalism training in Tanzania. For comments, please email to peik (a) kaapeli.fi. Finnish-language website can be found at www.peik.fi.